Waferash, ptelea, wingseed, shrubby trefoil, swamp dogwood, three-leaved hoptree, ague bark, prairie-grub, quinine tree, stinking ash, stinking prairie-bush, sang-tree, pickaway-anise. This native shrub is found in shady woods from New York to Florida and west to Minnesota and Texas, occurring in greatest abundance west of the Alleghenies. The hoptree is a shrub usually from 6 to 8 feet, sometimes 20 feet, in height, with leaves consisting of three dark green, shining leaflets 2 to 6 inches long. 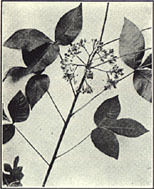 The leaves are glandular dotted and are borne on long stems, but the leaflets are stemless. The greenish-white flowers, produced in June, are borne in compound clusters at the end of the stems. Both leaves and flowers have an unpleasant odor. The flowers are followed by large clusters of winged, flat, roundish fruits each containing two seeds. They have a bitter taste. prev: Hophornbeam. Ostrya virginiana (Mill.) K. Koch. next: Horsechestnut. Aesculus hippocastanum L.